Rûm magazine is run by Harald Wawrzyniak and Maria Lichtenegger, two photographers based in Graz Austria. The two founded the magazine back in April 2015 that promotes analogue photography. From a first look, the magazine has a fresh whiteness to it. It feel in some way innocent, charmingly clean and quite. The cover photo, taken b artist Sebastian Reiser is both striking by its beauty, but also blends and fades into the white background of the cover. It welcomes the viewer to open the book up, as there is little details but the image suggests that there is much more to come, inside. Opening the magazine we come across the text the two editors wrote. Something they wrote touched me – “This magazine is making a dream come true….” In which they go on to explain their dream of analogue photography, slowing down the process and enjoying the passion that is photography with artists that feel the same. Yet, their first sentence hit home as it touched me in the core. I felt they were talking about me dream, the reason why Float is here, and why I am even writing these word today. Sharing the love for photography, and film photography in particular is a passion we share with them here at float. Moving along, the magazine is filled with 52 amazing artists from all over the world. There is no more text in the magazine, only images carefully arranged and juxtaposed together. There is an unusual, or maybe unconventional arrangement of the images in the white space of the pages. It is dynamic, fluid and in some way free. Some of the juxtaposes images enhance one another, support each other and give the two images more depth as a pair, even if they are from different artist, from different laces in the world, they manage to come together in a beautiful harmony and tell a story. One of my favorite spreads is pages 12-13 featuring artists : Xuecong Lin, Magnus Åstrom and Julia Borissova. 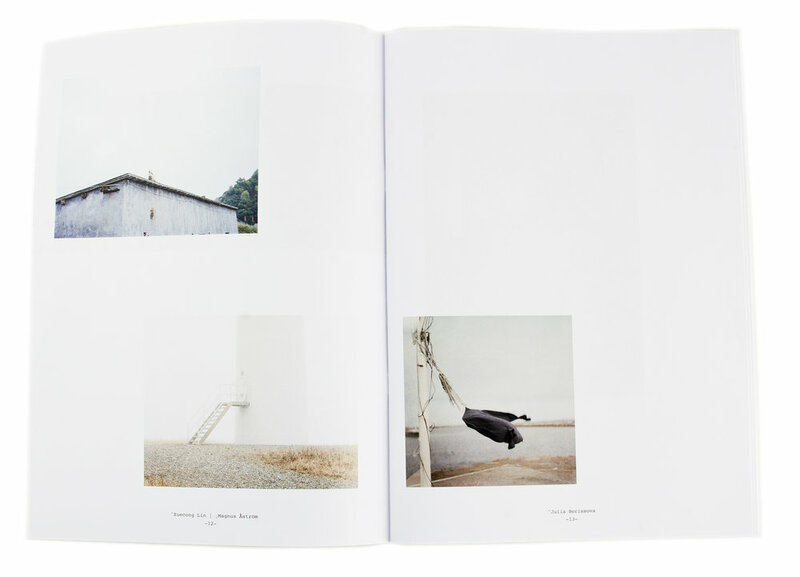 The pale colors of these pages , the gap between the images and the loneliness they tell, make a great spread. What I love most about looking through the magazine, is it feels cohesive, almost as if the photographers knew each other and their work, it feels like a group collective of one narrative – this might go for the fantastic curation and selection of images and artists, that made a wonderful magazine. This is a unique and great visual magazine, celebrating photography and film. Tudor Ciurescu, Ulrike Mayrhuber, Viviana Levrino, Xuecong Lin.